Deputy Religions Minister: How can it be that Jews are forbidden to pray on Temple Mount on Tisha B'Av? Deputy Religions Minister Rabbi Eli Ben Dahan (Bayit Yehudi) voiced his great displeasure Tuesday with the police decision not to allow Jews to pray on the Temple Mount on Tisha B'Av, and vowed to change the situation. "This morning,” he said, “on the fast of Tisha B'Av, the day in which every person in Israel feels the pain of the destruction of the Temple, the ascent of Jews to the Temple Mount, the place where our first and second Temples dwelt, has been forbidden, only because they feared rioting by Muslims. "How can it be,” he rhetorically asked, “that in Israel, in the name of the principles of equality and freedom of religion, Jews can be forbidden from ascending to the Temple Mount, the holiest place for Jews, because of a fear of rioting by Muslims? "It is time to change this reality. To stop using various excuses of security and the inability of the police to protect the Jewish citizens,” he determined. "Therefore, I will take action, with the help of G-d, to enstate measures that regulate prayer by Jews on the Temple Mount. This is a complicated step and many obstacles will be placed in its path but the eternal nation does not fear a long road. "The situation in which equality and freedom of religion are sacred principles only when talking about other religions, and not when talking about the Jewish majority in the state of Israel, is an absurd one,” he stated. A national debate rages over freedom of religion on the Temple Mount where, despite its supreme importance to Jews worldwide, Jews are subject to draconian limitations, including a ban on praying, due to the presence of an Islamic complex administered by the Waqf Islamic Trust, and threats by Islamist groups. Religious Jews who are allowed to ascend are followed closely by Israeli police and Waqf guards to prevent them from praying, or from carrying out any other religious rituals. 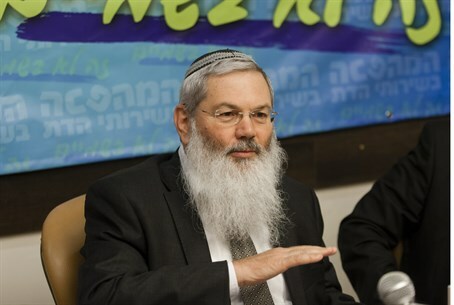 Rabbi Ben-Dahan's comments echoes statements made yesterday by Deputy Defense Minister Danny Danon (Likud-Beyteinu), in which he called for an end to the ban on Jewish prayer in the name of religious freedom. “That includes Jews. We must take steps to ensure that Jews are not only able to visit the Temple Mount, but are also able to pray there. I see no logic in allowing Muslims to pray there, but not Jews. I am committed to this idea."